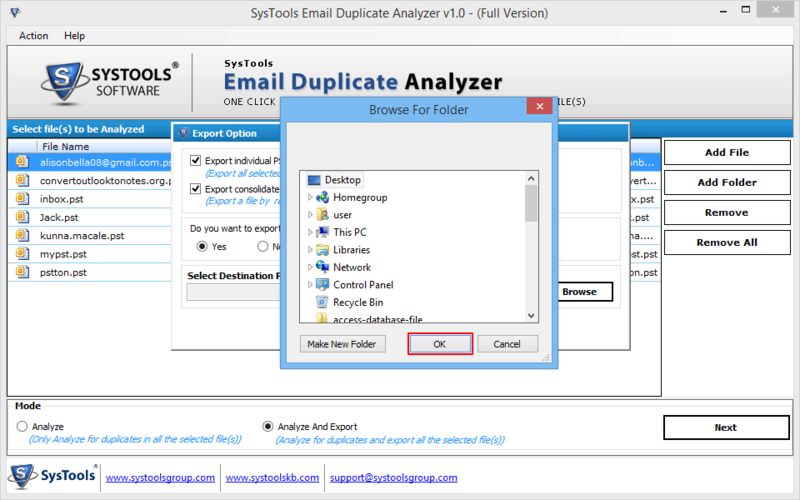 Email Duplicate Finder software is a versatile application that permits users for searching duplicate mails from one or multiple Outlook PST data files and remove them. 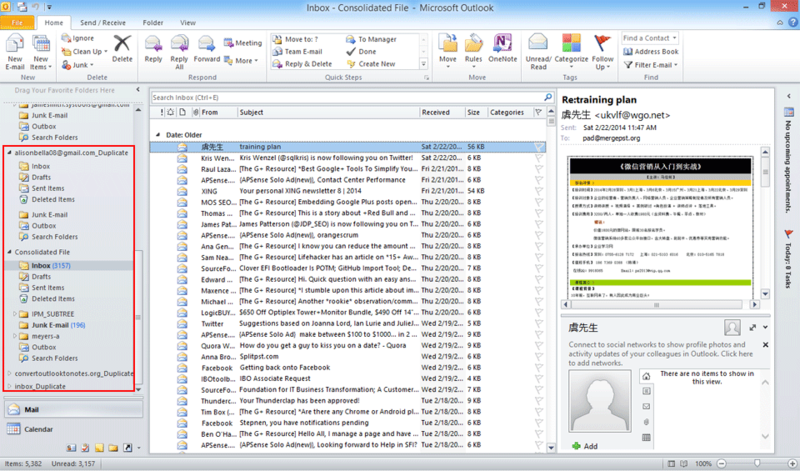 One can choose the complete folder that has various Outlook PST data files and the utility will list all duplicate mails. 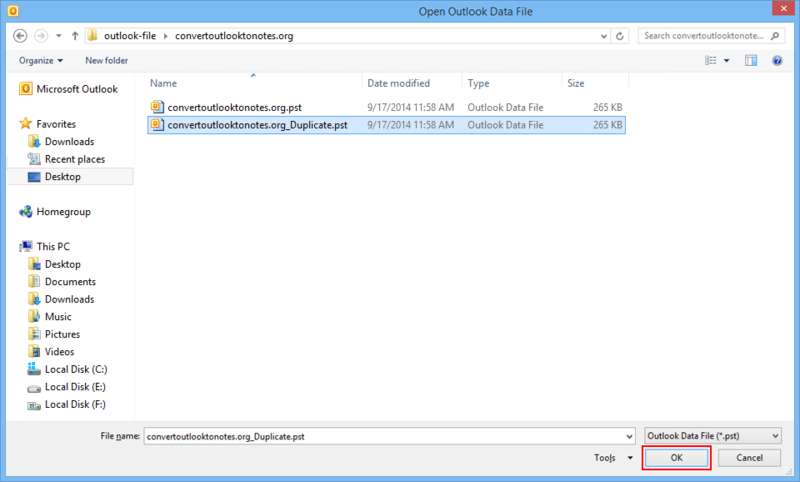 The utility provides an option to create a single Outlook PST file by simply combining all the desired PST files. 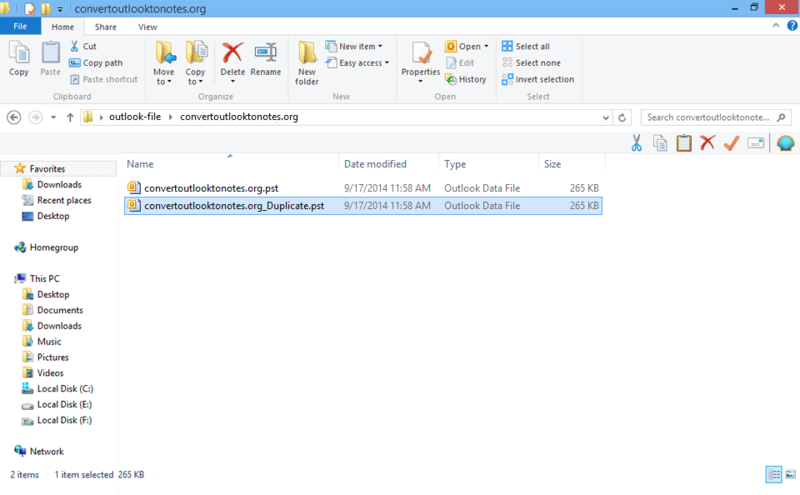 That one Outlook PST file will contain all the mails from PST files, which are analyzed. 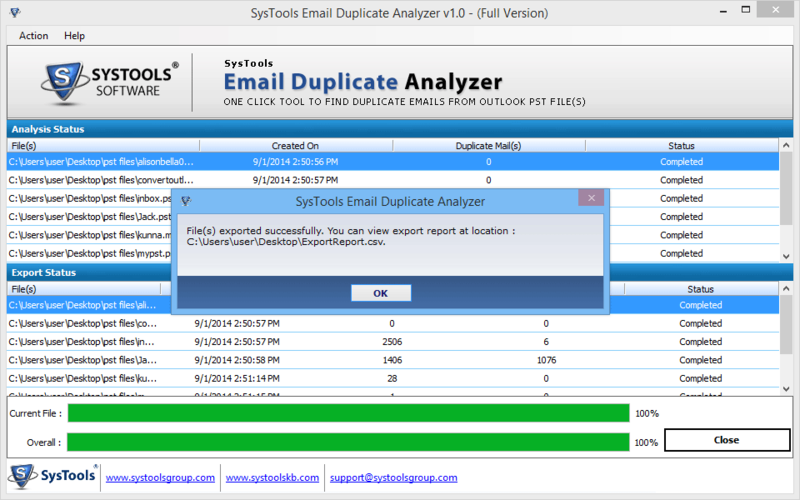 The application will remove all mails while exporting the Outlook PST data files. 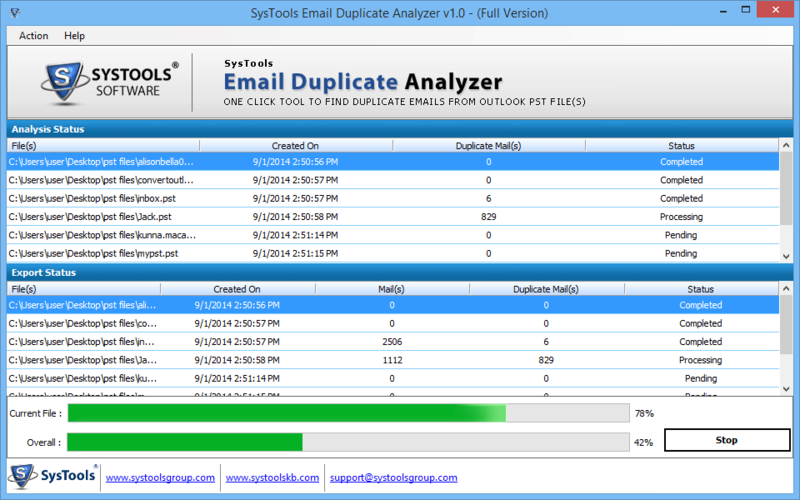 Email Duplicate Checker software generates a complete report after removing the duplicate emails from the Outlook PST mails. The progress report makes easy to maintain the record for future reference and can be saved in .csv file format. Q. Can I export the duplicate item of corrupt PST file? Yes, the application removes the duplicate from corrupted as well as password protected Outlook PST files. Q. Does the utility support ANSI PST? Yes, the application is designed in such a way that it supports both ANSI and Unicode PST files. Q. 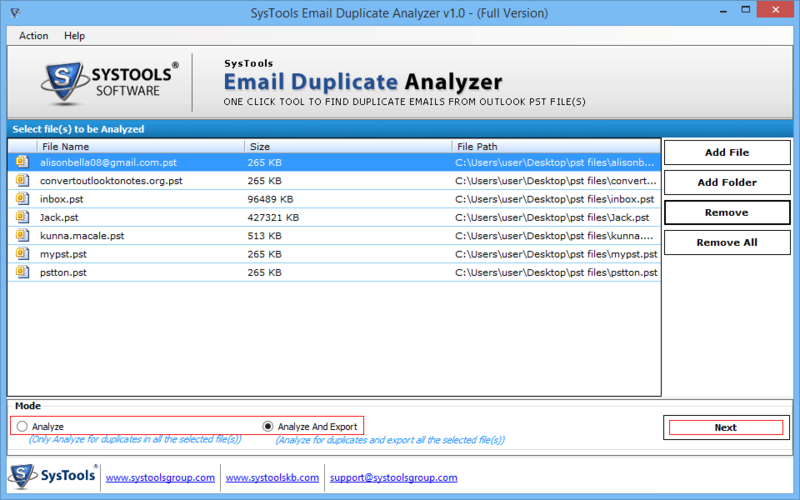 Is it important to have the Outlook installation in the machine for removing duplicate PST? Yes, it is important to have the MS Outlook installation in the system to perform the process. Before Purchase, Understand How the Product Works? Step 2 : Go to Add file Option and click on it. You can also click on “Add Folder” to add a file. 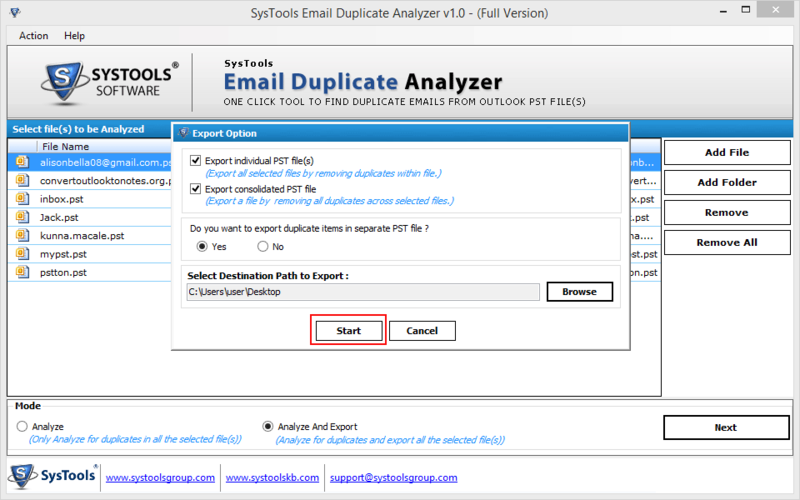 After select the above option, then go to Mode option and select “analyze” option to analyze duplicate emails. Step 3 : Select the PST File from Local Drive. Click on Open button. 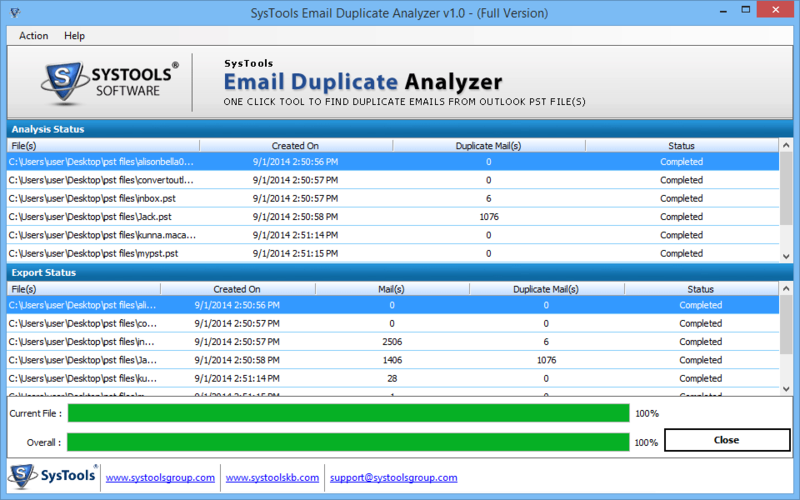 Step 4 : If you want to remove the duplicate emails select the file and click on remove option. 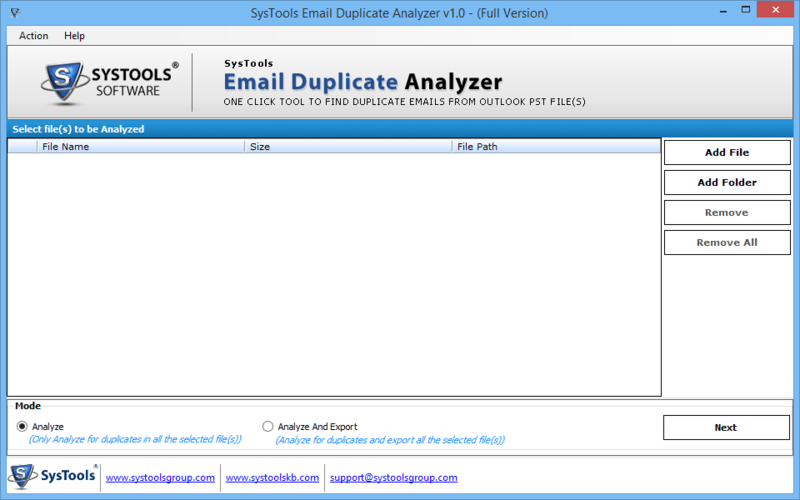 Analyze Mode:- If you want to only analyze the duplicate emails so click on analyze mode. 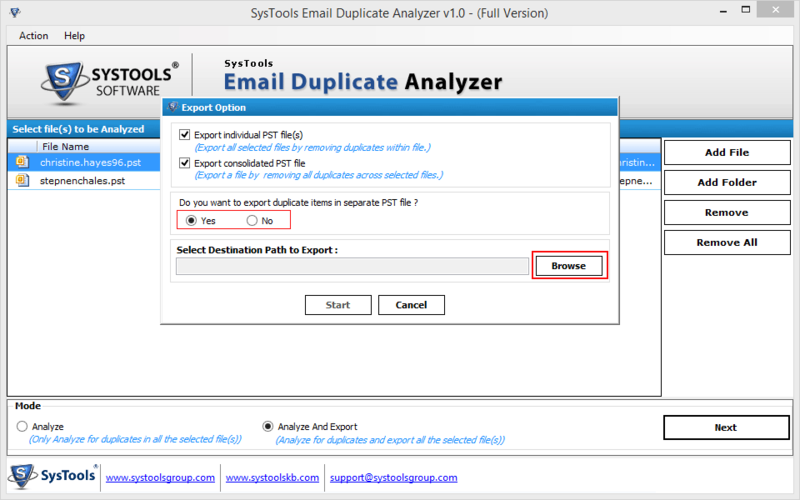 Analyze & Export:- If you want to analyze the duplicate emails and also export in PST format for future purpose, so select the Analyze & Export option. 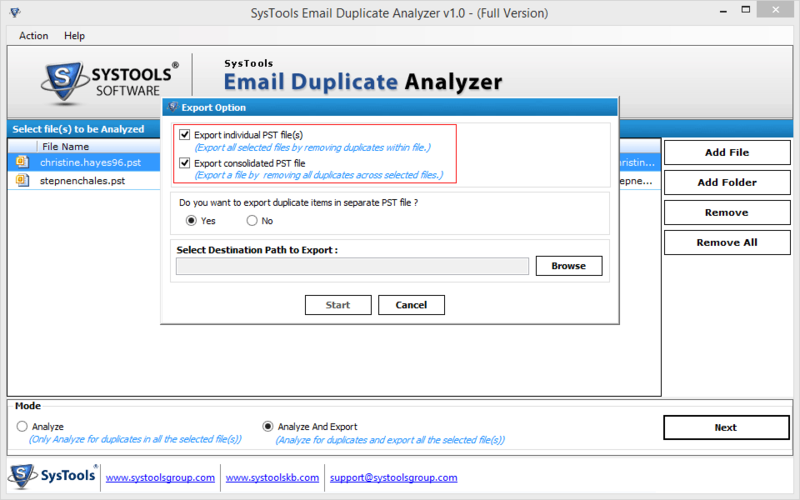 Step 6 : Email duplicate checker tool provide two Export option:- (a) Export Individual PST Files and (b) Export Consolidated PST File. Export individual PST file allows to export PST File after Removing duplicates. Export Consolidated PST file allows to merge PST without repeated emails. Step 7 : Now choose the desired option from Yes or No. If you want to export duplicate items in separate PST File, click on Yes. Otherwise Click No. Step 8 : Go to Browse option and click on it to save the PST file at a desired location. 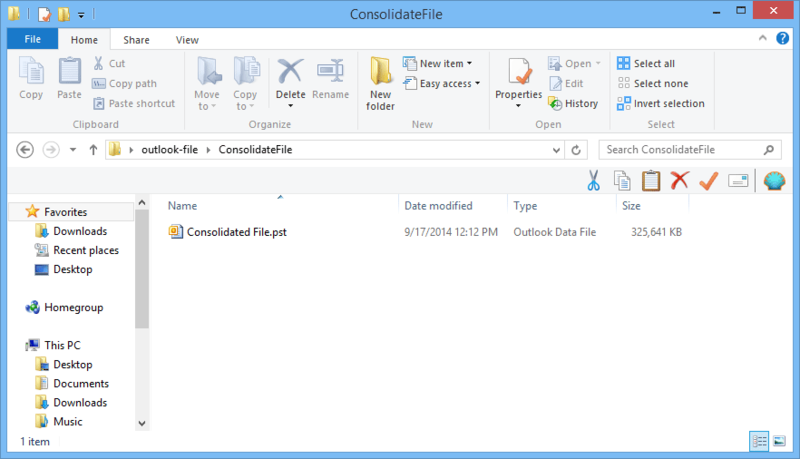 Step 9 : Select the desired folder in which you want to save the output PST Files. Click on Ok. Step 10 : After selecting the destination path, click on start to continue the process. Step 11 : Export and Analyze option gives you a concurrent results of Analysis and Export. This option not available in demo version. Step 12 : After completion of processing, tools gives a successfully confirmation message. Step 13 : Click on close button to close the email duplicate finderapplication. Step 14 : To preview the output PST file, Go to the location where you saved PST File. 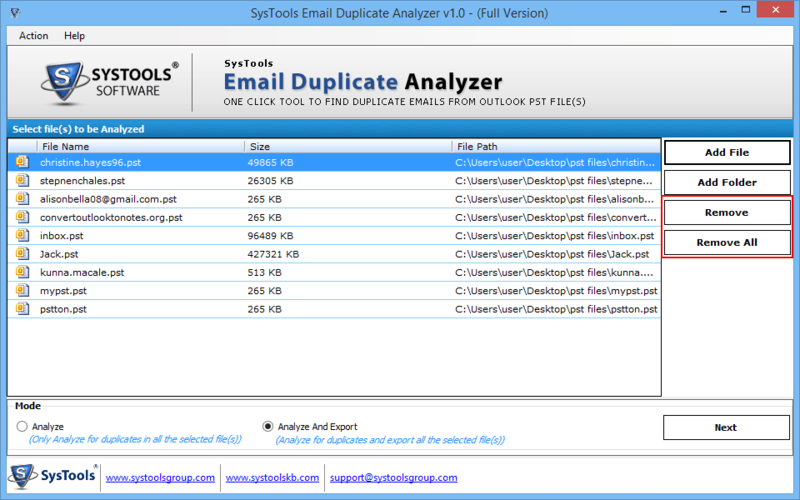 Step 15 : Preview the consolidated PST created for all the PST files after eliminates duplicating. 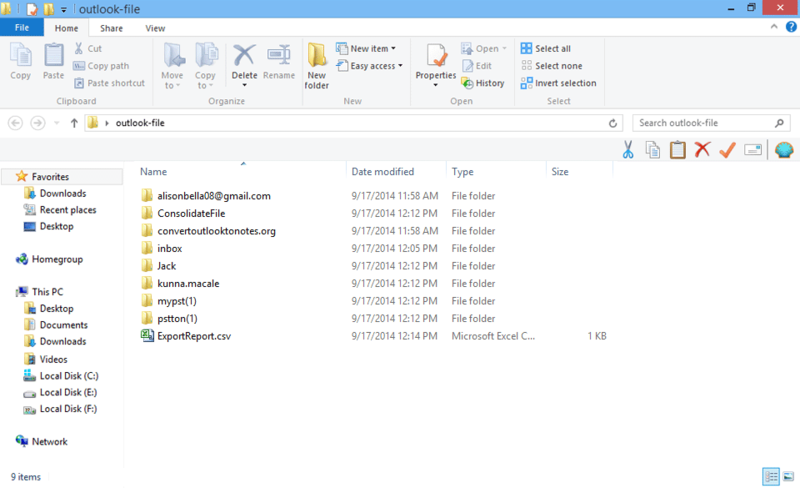 Step 16 : If you want to explore the other folder in which you the PST file containing duplicate email only is stored. 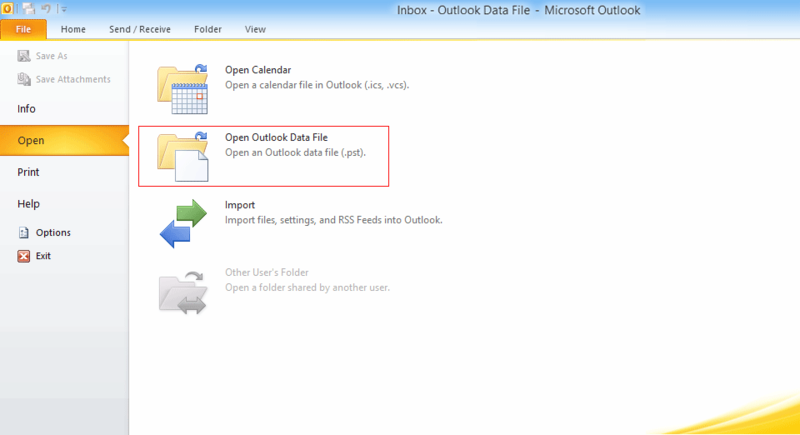 File Menu >> open>> select outlook PST File. 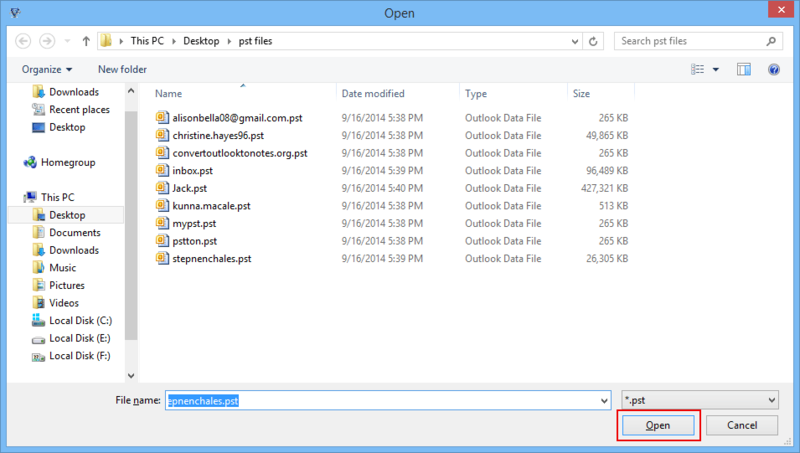 Step 18 : To Open the Outlook PST File, browse the window where you saved the PST File. Step 19 : View the output PST File in MS outlook. 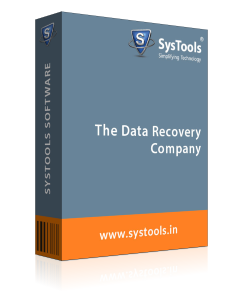 The best thing about the software’s working is that it provides plethora of features, which makes it a flawless solution for removing duplicate emails. In addition, the liberty to remove duplicate PST in batch saved lot of time.